Here in the desert Southwest, we have the good fortune of mild winters. Even when the temperatures become chilly, our outdoor living and entertainment options are downright amazing. Pool owners have an interesting choice to make during the mild winter months – how to continue to enjoy that relaxing oasis? Our weather allows us to enjoy poolside entertainment, even if the water is a bit cool for swimming. Of course, many owners opt to install a heater so they can continue splashing their way through the mild winter months. 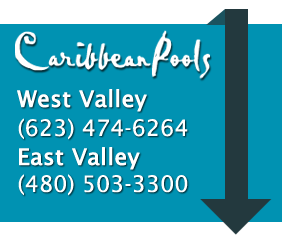 Whether you choose to swim or not, we recommend you keep the pool operating year-round. Algae, stains, debris, sunlight, and weather can take a toll on a pool, no matter the season. Pumps and motors are designed to be used continuously. Letting the equipment sit unused for prolonged periods of time in the elements allows moving parts and bearings to lock or freeze up, and you may find yourself needing to repair it at the beginning of the next swimming season. To prevent any damage from sitting idle, we recommend some basic pool maintenance tips. Of course, you can always choose to hire a pool care service – the winter schedule might be less frequent (and less of an expense). If you do hire out maintenance, keep in mind that you’ll still need to keep remove leaves and empty the skimmer basket between service dates. Whether you choose to swim through the cooler weather or just enjoy the sparkling poolside from a lounge chair, following our easy tips will keep your pool in beautiful shape all winter.